The development of Bandar MSC Cyberport, Johor's first Multimedia Super Corridor (MSC) cybercity, is set to commence in the second quarter of next year. The cybercity is a RM1.16 billion development within Iskandar Malaysia development corridor operated and managed by MSC Cyberport Sdn Bhd. Executive director Ramlee Jaafar said so far, memoranda of understanding have been signed with two foreign companies. "One of them is Sunil Mantri Realty Ltd from India and the other is a Korean company which I cannot reveal at this moment in time," he said. "Submissions for development will be made in the first quarter of 2009, so we expect network development to begin by the following quarter," he added. Speaking at a roadshow for the MSC Malaysia-British Telecom Digital Lifestyle Initiative in Johor Baru, Ramlee said despite the economic slowdown, the company will not review the cost of the project. "We will instead be re-setting our priorities and focusing on important projects," he said. 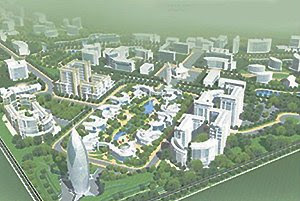 MSC Cyberport is a 60-hectare information, communication and technology (ICT) city within Iskandar Malaysia. Its location in Kulai where the Second Link and the North-South Expressway meet is seen as strategic for its function as a global ICT business hub with a world-class living environment for ICT companies within Iskandar Malaysia. PETALING JAYA: MK Land Holdings Bhd’s strategy to turn around the company amid the current economic slowdown will see the property developer focusing on medium-cost and affordable homes, said chief operating officer Lau Shu Chuan. The turnaround planto be carried out in three phases was expected to be completed in three to five years, depending on the market outlook, he said yesterday after the company AGM. “We are at phase one now where we are strengthening our cashflow positions and transforming into a more structured and focused entity,” Lau said. “We are now returning to black with positive first quarter results and will move forward with the turnaround plan.” For the first quarter ended Sept 30, MK Land posted RM4.91mil net profit compared with a net loss of RM8.45mil a year ago. For the financial year ended June 30, the company posted a net loss of RM60.9mil. Although the property sector was softening, it would navigate around that by offering a good mix of products, Lau said. “We build niche property, medium and also affordable houses. In other words, we offer different type of products for different markets. If market is looking for more affordable house, we have the products for them. By this, we are able to position ourselves to take advantage of different market situations,” he said. From July to November, MK Land sold RM54mil worth of properties including apartments and shop offices, while projects valued at RM23mil ar are being built. Lau said although the group did sell plots of lands, the main focus would be on selling completed properties, adding that there would be new property launches next year. However, he declined to offer details on the new property launches. Malaysia'S property market is expected to be resilient next year due to lower borrowing costs and as demand from foreign buyers remain strong, an industry executive said. "It will be harder to do deals next year but there won't be a slump. 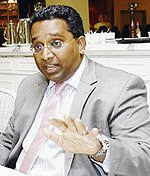 People are still looking for homes to stay and invest in," said Previndran Singhe, chief executive officer of real estate consultancy Zerin Properties. Previndran: People are still looking for homes to stay and invest in. There will be a slew of new residential property launches from the second quarter next year and these are high-end products. Key launches next year include 6 Stonor by Tan & Tan Development; The Pearl@KLCC by Malton Bhd; Platinum Park Residences by Naza TTDI; The Oval by Guocoland (M) Bhd; and Idaman Bintang by TA Properties Sdn Bhd. Previndran said there is demand from locals, and investors from Europe and the Middle East for completed properties and new products in the Klang Valley. "We are seeing more genuine buyers from these regions," he said. Previndran said while the price of new landed and high-rise properties will be relatively similar to current levels, there will be more attractive marketing schemes. "Developers are not going to lower property prices as construction cost is still volatile. What they will do is offer more goodies," he said. He also expects a few en bloc deals over the next few months. "There will also be more sales and leaseback, which will be fed into REITs," Previndran said at a property outlook briefing in Kuala Lumpur yesterday. Zerin also introduced its new website www.expathomekl.com for expatriates at the briefing.